The Feghouli formula. Should he stay? Should he go? Do we need him? Does he need us? I’ve supported West Ham all my life, and with my Algerian background and knowledge, I hope to shed some light on this debate. Now I totally understand that every fan is entitled to their opinion. Some people will agree with me, others will disagree. Perfectly fine. But first of all, show Feghouli some respect. For people to go on camera publicly and call him “useless” and “want him binned” is ignorant and naive. This is a man who got a goal and an assist with Algeria at the World Cup and helped them get further than England. A man who has more goals in the Champions League than the rest of the current West Ham squad combined. A man who scored in the first ever game at the London Stadium. He signed for West Ham on a free transfer – a deal that still to this day has to be considered a bargain. Feghouli had big money offers from Turkey, which he chose to turn down for a move to East London and you have to praise him for that. Feghouli was our best player in pre-season and no-one can argue that either. Even though the results in the friendlies were pretty poor, he was showing so much promise. Only Dimitri Payet has more assists for West Ham this season than Sofiane Feghouli in the Premier League. And considering how little game time Soso has had in comparison to other members of the squad, it’s a very positive record. Feghouli and Carroll built up a very good understanding with each other in pre-season, but with the latter unable to keep fit, it has been detrimental to this partnership. We saw the two link-up brilliantly away at Swansea. And both were on the score-sheet vs Crystal Palace. Furthermore, Feghouli has been very unlucky this campaign. Cut him some slack. He picked up an injury in the warm-up of the first game of the season against Chelsea. A spell on the substitute’s bench then meant that he was dropped from the Algeria squad for the Africa Cup of Nations. This really hurt him, because he went from being the best player in the national team three years ago to not even making the squad of 23. And when he did get back in the West Ham team, Mike Dean showed him a ludicrous red card. These are all contributing factors to a devastating psychological blow. People say Feghouli has been too inconsistent, and that he struggles to deal with defensive duties. But you could make a case for most of the squad being inconsistent this season. Aaron Cresswell for example – he’s been below par. But we are letting him off the hook because he’s English? Feghouli’s spell in the team was on the right wing, with Cheikhou Kouyate behind him at right-back. His game would have been aided with an actual right-back alongside him down that flank, as he did with Barragan at Valencia. If you give Feghouli the freedom to run at people, he can be unstoppable at times. His little cameo against Liverpool on the weekend was a perfect example of that. The result of the match was gone, and the shackles were off. You could see that was what Slaven was telling Sofiane on the touchline. Have a go. He was the only one in claret and blue trying on the weekend. I’m not saying he should start every single match, be we need our #7. West Ham fans say the squad needs strengthening. And they’re right. It needs work in the summer. But letting Feghouli go? That’s not strengthening; that’s weakening it. Can’t lay the blame at his feet solely, every player has a part to play. They’ve All been inconsistent this season. However he has been caught out a few times and not tracked back to help out the full back. If you’re a true supporter than you would know pressure from the fans has led to Cresswell being dropped from the team in favour of Masuaku, rightly so. It has nothing to do with “because he’s English”. Feghouli has simply not made the cut in the Premier League. His free price tag does not automatically make him a bargain, he’s probably taking about 100k out of the club a week. I agree Feghouli was outstanding during the preseason and I believe has a place on the team. I just think that it is a little harsh to say the only reason Cresswell get slack is because he’s English. Being a hammer fan you know what an amazing year last year was and Cresswell was a big reason for that. He had a tremendous year and built up some leeway with the club and fans, where Feghouli is new to the team this year where the struggles were evident from the start of the season all the way through. Feghouli in my opinion is a very good player when utilised to his strengths. When you look at our season we have endured a lot of changes, from the Stadium to new players gelling and we have been impacted by a spate of injuries to key players too. 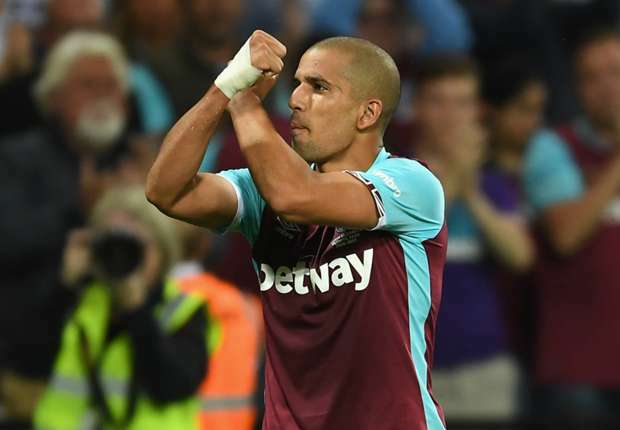 Feghouli whenever he’s played has been a breath of fresh air and I personally feel he should stay and develop a partnership with Lanzini or one of our forwards, who ever this may be in the new season. Feghouli has all the attributes to become a great player at West Ham United.